There’s a rumble of thunder as I type, setting the tone adequately for how I feel at the moment. It heralded the arrival of torrential rain and as I sit at home with the curtain closed in a darkened room I can hear it hammering down on the roof of the wheely bin under my window. The day is almost over and done with and like every Thursday that came before it will be followed tomorrow with Friday, which for once I wish wasn’t the case. I’m writing instead of getting upset but honestly I don’t think the two are mutually exclusive at the moment and I may end up doing both before I go to bed tonight. My desk drawers at work are now empty. I moved all of my staples and paper clips into a Tupperware tub and put it in a big box nearby ready for disposal or re-use. Until a few days ago the tub with a green lid and a smiley sticker contained conkers. There’s a tree in the grounds of the building that drops them in abundance and several years ago I collected loads of them to dry out and have a contest with my team to cheer them up. I never got enough interest in the proposed activity but kept the conkers at the back of my drawer just in case for nearly a decade before finally throwing them away. If the conker contest would ever have finally happened then mine would have been like perfectly aged orbs of granite that would have easily smashed their way to victory. Sadly it wasn’t to be – and instead of being the occasion of a final jubilant conker contest today was spent disposing of confidential waste and emptying unwanted possessions from desks, lockers and the kitchen cupboards into bins. Oddly I came home with an unwanted cushion and 12 weetabix. As people looked at the odds and ends left by colleagues and claimed orphaned mugs or cans of soup from the rest room I thought how sad it was that we were all picking at the bones of something that had died before its time. It’s an ignominious end to something I loved – and to see the chairs, desks and room emptying of possessions and people is frankly heartbreaking. A cushion and 12 weetabix though. Is that what it comes down to? I have no idea why I picked them up. It’s these often unnoticed everyday footprints that people leave behind that I find so poignant. Little things are playing on my mind such as the card we all signed yesterday to say goodbye to the cleaner who has dusted our desks, washed our plates and hoovered our floor for years. She’s quiet and unassuming but always asks me about my Dad and remembers stories that I’ve told her from years ago about his visits and his love for fish and chips. I don’t know what will happen to her – but I know if she loses her job when we go it will definitely change not only her circumstances but those of the local birds. Every day she works her allotted hours and before she goes home she sprinkles a bag of breadcrumbs that she brings from home by a tree outside reception where I sometimes park. Often she leaves straight away, satisfied that her task is complete and because of this little act of kindness I regularly see birds pecking away at the bread when I go outside or look through the window. No-one asks her to do this. She’s just a nice lady and it makes her happy. I’m going to miss these unique elements that nice people bring to that place – and the good humour that surrounds them. As you can tell today I’m not taking this well. Now I’m at home in silence it’s all that’s filling my head and I’m trying not to get upset. I think the only emotion keeping tears at bay today for myself and others has been one of collective annoyance at still being there at all – rather than just being told to go home and that we’re sacked like the majority of us certainly will be tomorrow. Although drawing out the inevitable seems like a curse of sorts it’s also a minor blessing and gives people something to grumble about while they sit at desks wanting to leave instead of letting other feelings overwhelm their inner monologue. I do wish the snacks would get lost though. Since sad people like to eat, food has been all over the place this week, ranging from chicken samosas and spring rolls to cakes and donuts. Today was no exception and from a dietary perspective I’ve been in a special kind of hell. 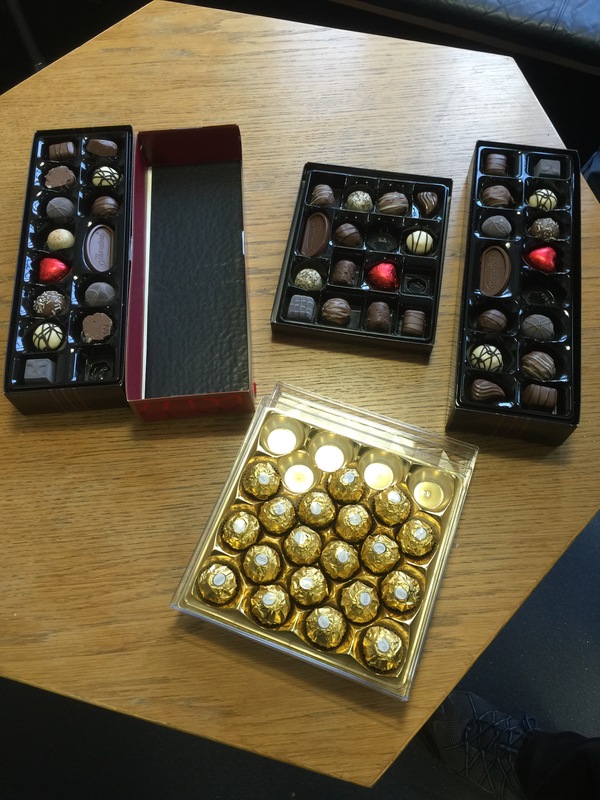 Chocolates (courtesy of the centre director) were in abundance, and thanks to some visiting colleagues from the Netherlands who came to say goodbye there were also loads of caramel waffles around. The sandwich lady (who visits our premises daily early in the morning) was also compounding my misery by giving away complementary carrot cup cakes to colleagues, which tantalisingly looked perfectly moist with an alluring swirl of frosting on the top. Later in the afternoon my manager also found a large cache of boiled sweets in his desk – which he proclaimed never went off ‘because they’re boiled‘ and tried to ply them onto everyone nearby. 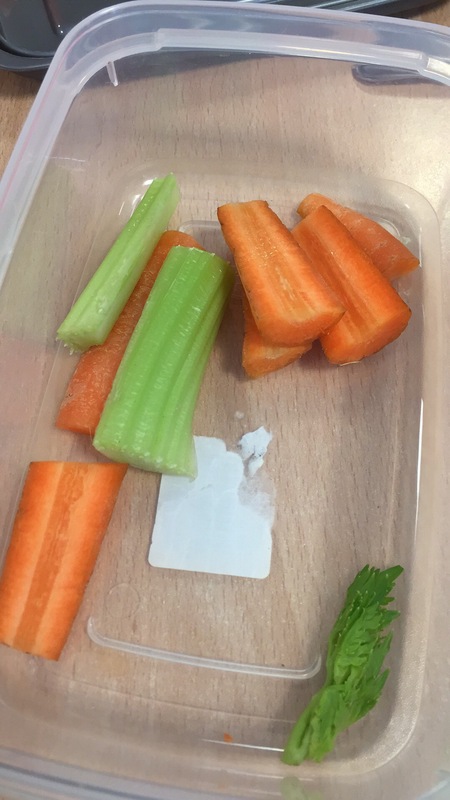 As with every other day this week I politely declined all of it and munched my carrot sticks and celery. When I left there was a single Thorntons chocolate, sitting on its own in the box. It’s sugar dusted and crisscross patterned top just stared at me suggesting I should put it out of our mutual misery and eat it. I can’t honestly say the same for the ham, apples and cherry tomatoes in my fridge though which took an unwarranted kicking when I returned home. They are now reduced to pips and packaging and I think definitely regretting entering my house. Tomorrow it’s the goodbye drink at the pub, and I’m not sure my resolve will be so strong. The ladies at Slimming World have helpfully suggested some strategies for survival – but this may be one of those days where I just take the hit and live with it. Internet if there was ever a week when I wanted everything to be simultaneously over and done with and also for it to never end this is it. Since I can’t eat junk food, I no longer drink and is absolutely slashing it down with rain outside I will instead spend tonight online with a friend laying waste to any alien scum stupid enough to pop up on my television. They are ALL going down. To Chinatown. Be strong Davinsky, just a whatsapp away to give you some silly remarks if needed! *hugs* Hang in there. Goodbyes are never easy. I admire your stenght with the chocolates. Wishing you good luck, stenght, but also some fun at the goodbye drinks today.